← Cargo Saddlebag Pole Frame Push Buttons Hard To Depress? The new version of our Cargo Saddlebag was released in October 2012. 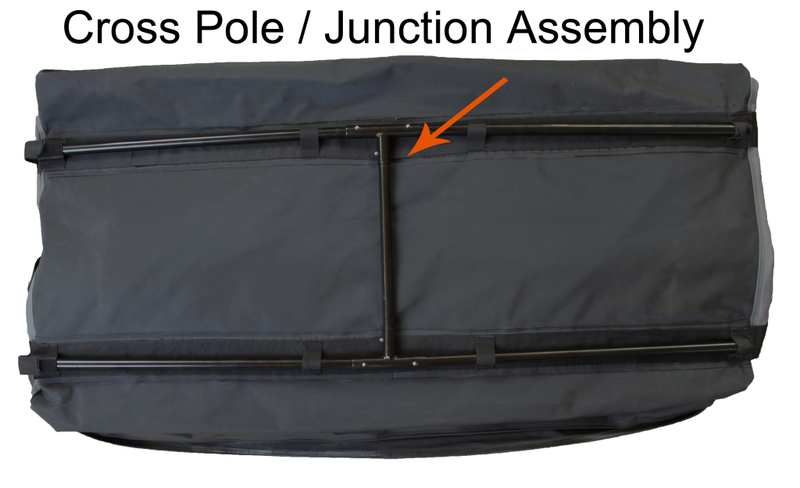 It features a bottom pole frame that replaced the hard plastic sheet in the previous model. We are sorry to say that in our first production run, the cross pole / junction assembly was fabricated 1.5″ too long on a few units. This extra length prevented the pole frame from fitting in the pole guides. Solution: Affected customers were sent a new cross pole at the correct length. If you have purchased a Cargo Saddlebag and something is not working 100% correctly for you, please contact our Warranty Department at 888.685.GEAR or complete the Warranty Service Questionnaire. This entry was posted in Cargo Saddlebag Tips and tagged Cargo Saddlebag, Rightline Gear, car back carrier, rear luggage carrier. Bookmark the permalink. 2 Responses to Cargo Saddlebag Cross Pole Too Long? what do I use for license plate illumination? Our research has found that laws concerning license plates, their attachment, and their visibility vary from state to state. If you would like to have a lighted rear plate when using our Cargo Saddlebag, we recommend placing a small keychain-size flashlight in the license plate pocket. The pocket is accessed from the inside of the bag and has a velcro closure across its top. The keychain light will sit in between the license plate and the clear pvc license plate window. Many of our customers have used this solution with positive results. Thank you for your interest.